Shown announcing the three-year contribution to help revise and update the Wildlife in Focus Kritters 4 Kids wildlife education program are (from left): Bruce Hoffman, Wildlife in Focus board president; Crystal Mead, Wildlife in Focus executive director; Dianna Bluntzer Sherman, managing director of the Art Center of Corpus Christi; and Julio Reyes, AEP Texas vice president of External Affairs. 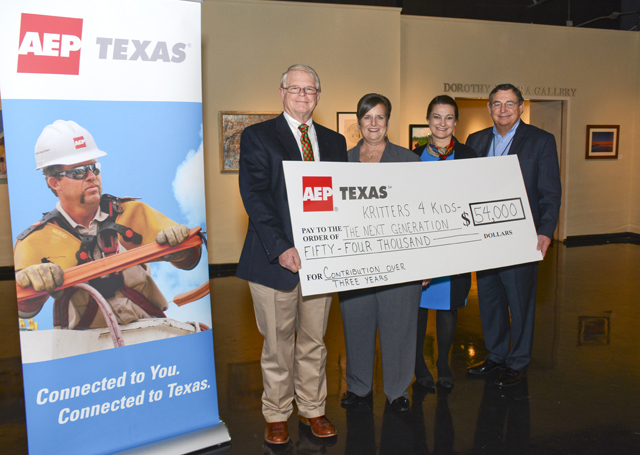 AEP Texas has announced a three-year contribution totaling $54,000 to help fund an initiative to revise and update the Wildlife in Focus Kritters 4 Kids wildlife education program. The first installment was awarded to the group prior to the end of 2014. Update the current curriculum topics and subject matter to ensure the program continues to support existing science and other scholastic programs and provides support for the State of Texas Assessment of Academic Readiness (STAAR) test. Expand the curriculum to incorporate an arts component to support the move from Science, Technology, Engineering and Math (STEM) programs to Science, Technology, Engineering, Art and Math (STEAM). Submit the newly expanded program for review and certification by the Texas Education Agency (TEA), as well as other agencies identified by the Wildlife in Focus Board of Directors. Incorporate a digital version of all materials, including PowerPoint presentations, videos and Adobe PDF handouts for classroom use. These digital materials and presentations will be used in conjunction with a set of the most recent Wildlife in Focus photo books. Expand upon the “Get Art Centered on Wildlife in Focus” partnership with the Art Center of Corpus Christi to continue promotion of the Kritters 4 Kids program during the development process via the sponsorship of targeted events. Additionally, AEP Texas will provide in-kind and financial sponsorship of the production of materials necessary to introduce the new education program. This support will include video production and development of PowerPoint and other supporting materials under the direction of the Education Coordinator and team of education advisors. Julio Reyes, AEP Texas vice president of External Affairs, said that AEP Texas has helped sponsor several events in the past and has sponsored the Kritters 4 Kids programs in several schools within its service territory and sponsored advertising in the photo books that are produced following each of the nature photo contests. He also noted that AEP Texas employee Larry Jones has served as a volunteer and board member over the past few years.